On Wednesday evening Digital Eskimo, those fine purveyors of all things sustainable in design, hosted Design Thinking Drinks. Present were members of the service and interaction design community, as well as customer-centred designers from financial institutions and a few interested members of the public. It was an extremely engaging and uplifting night that has given me a very positive sense of the Service Design community of practice in Sydney. I was recently requested to write a review on Qype of a B&B* I stayed at in Italy. I was impressed with the manner in which Qype asked me for my review: “write as if talking to a good friend (in front of your mother)”. This prompt for more ‘natural language’ was a friendly way of making sure that Qype reviewers are not tempted to write in an overly formal manner. The Qype content, therefore, remains friendly, open and approachable. Our washing machine has a handy design feature. The legend for all of the letters used on the dials of the washing machine is printed on a waterproof slip of paper that is found in a special slot built into the powder drawer of the machine. You never have to search for the book (which is always buried under a pile of stuff in the 3rd drawer down!). The instructions are kept close to where they’ll be needed. My cycling jacket has sleeves that are detachable via zippers. The designer has cleverly made it so that it’s impossible to switch the left and right sleeves when putting them back onto the jacket. The way they’ve done this is to have the head part of the zipper on the body on the right hand side, and on the sleeve on the left-hand-side. You can never put the sleeves on the wrong side. When did elevators get so smart? Once they just went up and down, and now they alter their direction based on demand. Today I was visiting the developers at another building and didn’t really think too strange when I first pressed the floor number. At the time it hadn’t occurred to me that I was choosing the floor as the first step of the process, on the outside of the lift rather than inside the lift. It was only when I got inside and couldn’t find the usual floor buttons that I realised something was different. My more intelligent companion then noticed that the display above the door close/open symbols was displaying our chosen floor number. Am trying to find a nice little cottage in Scotland for summer. After finding one in Loch Ness on the Travel Scotland website, I was amused to receive the following gems of error message advice. Yesterday, when doing some much needed filing, I realised I only like one of the services my current bank provides for me: the pre-punched holes in my bank statements. Other than that, Lloyds TSB have been appalling bad with their service. There are plenty of great examples on the web of how companies use certain styles of language to brand their customer’s experience. This is one I came across recently in on Pattern Tap: an irreverent take on the usually boring ID process that doesn’t, I think, take away from the seriousness of the sign in process. Perhaps it would not be appropriate say for a company with an older audience for whom carding might be a long-forgotten experience, but for a younger audience, I think this language is spot on. I am working on a job at the moment that requires a user to sign in before redeeming loyalty benefits. The problem is that the company’s standard sign in is dry, and completely lacking in any of the character that the company is known for. I am hoping to get a chance to talk to those responsible and urge them to vamp up their sign in process a little. We have just returned from the National Portrait Gallery’s exhibition of Irving Penn’s portraits. Truly extraordinary and exquisite photographs that I am so glad to have seen up close. I had become more familiar with his work through Alex Craig, a friend and photographer who was inspired by Penn when we were shooting for the 2007 Company B Season book. 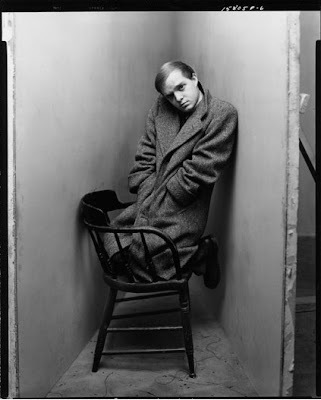 Alex wanted to pay homage to Penn’s use of the contained space, as seen in the full-length portraits of people such as Truman Capote in the 1940s. The portraits below are of Catherine McClements for Who’s Afraid of Virginia Woolf, and Richard Roxburgh for Toy Symphony. One of Irving Penn’s portraits I really liked was that of Saul Steinberg (below), such a perfect way to shoot such an irreverent cartoonist. Another person who loves this portrait is illustrator Wayne Pate who has drawn his own version of the portrait in lieu of being able to afford the some $20-30,000 required to buy a print of the actual photograph. IRVING PENN: Saul Steinberg in nose mask, New York, September 30, 1966. SAUL STEINBERG: Untitled, 1957. Ink on paper. Originally published in The New Yorker, June 1, 1957. Via The Saul Steinberg Foundation.